Flyff has a pretty unique party system which allows players to level the party up when the players are killing monsters within a close proximity of each other. At least two players need to be close to each other in order for the party to get experience from killing the monsters. 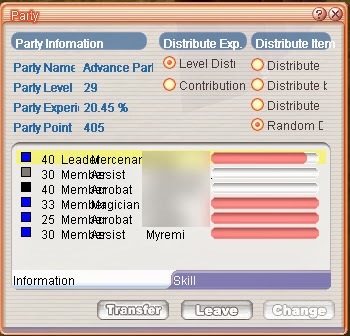 Once the party is level 10+ the leader of the party can start to activate party skills which can increase the experience gained by the players in the party, double the item drop rates as well as boost various stats for party members. The party has improved experience when it has the maximum amount of party members. Each skill requires the party to be a certain level to be used and uses up party points which are obtained each time the party levels up. When all the points are used up players can't activate any of the party skills until they accumulate more points by leveling the party up. Besides that the Flyff party system offers all the other standard features that most MMORPG parties have. Such as the various ways to share loot, invite players, transfer party leadership between players, and various others things that a party system needs on an MMORPG.